Homeowners generally add a deck for the purpose of enhancing their outdoor living space. However, it’s prudent to think about the money you can recoup should you decide to sell your property down the road. According to the 2018 Cost vs. Value Report, wood and composite deck additions generate an ROI of up to 88.9% and up to 72.8%, respectively, in Pacific cities. While both materials have their own set of pros and cons, there’s no doubt that more people still prefer authentic wood. But then again, understand that hardwoods and softwoods usually require more maintenance than their composite counterparts do. The longer you intend to use your wood deck, the costlier it may be to own. Think about upkeep when considering it as a home improvement investment. Most homeowners love to have a deck big enough to host gatherings with friends and family. However, it should still match the scale of your home. Building a deck that’s no larger than your most spacious room is a good rule of thumb. To maximize the function of your deck, connect it to either the living room or the kitchen. This makes it more convenient to bring food and other items to and from your deck when entertaining visitors. The most attractive decks are full of amenities. Having a kitchenette or a Jacuzzi is always impressive. But if minimalism is the theme of your home, don’t skimp on furniture to keep yours elegant despite being simple. 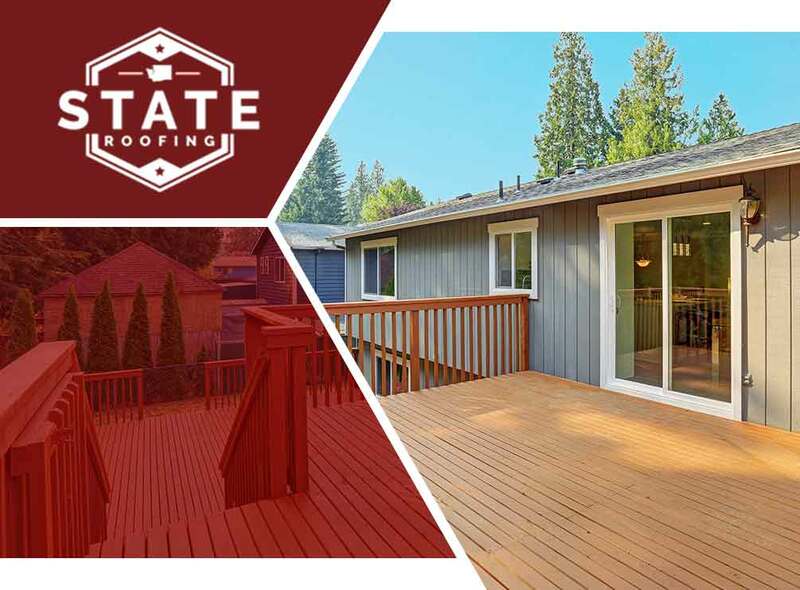 State Roofing offers a wide selection of decking solutions to satisfy different needs and budgets. Call us at (360) 205-3100 now to talk about your project ideas, and receive a free estimate in Tacoma or Seattle, WA.